ETF investing is exploding in popularity and the number of available choices is proliferating as a result. That’s good in many respects but it also means that it’s more difficult to buy the right fund. If you’re wondering how to pick an ETF that’s right for you the following should be really helpful. Clearly the most important first step before you invest in anything (ETF or otherwise) is to be very clear on your objectives. If your objective is short-term high growth (called speculation) you will use one set of criteria to pick an ETF. If you want to achieve long-term growth, you’ll use a different set of rules. For illustration purposes, I’ll assume that you want to buy a large-cap growth fund. You’ve come to this conclusion either because you are a buy and hold investor (not recommended) or because – based on your investment strategy – you have determined that this is how you want to invest now. At this point simply call your custodian. Most established custodians have long lists of ETF investments that are available. I strongly recommend you consolidate your investments at one custodian to make this easier but that’s the topic for another post. My custodian makes this part of the exercise super easy. Their website allows me to filter all the available investments such that I can create a list of all the large-cap funds – including ETFs. You can see a partial list below. And it gets better. Most custodians have ETF’s that you can even buy and sell with no sales charge as long as you hold on to them for some minimum period. I work with TD Ameritrade and they offer over 100 such commission-free ETFs. Once I download the list I get rid of all the mutual funds by simply emptying the list of all symbols with more than 4 letters. Any security with more than 4 letters is a mutual fund and we’ve already decided that we want ETFs and not mutual funds. At this point we know what we want and we know the alternatives. It’s time to narrow our search. We’ll look at performance, liquidity and (consider) expense in order to make the final selection. ETFs are great – but don’t discount the idea of low-cost mutual funds either. If you include them in your universe, you have more choices and the potential for greater performance as well while keeping your costs low. Let’s first look at liquidity. You want ETF’s with lots of liquidity. (Liquidity means the fund has a great deal of money invested in it and millions of shares are traded every day.) That’s because more liquidity reduces the “spread”. The “spread” is the difference between the buy and sell price. 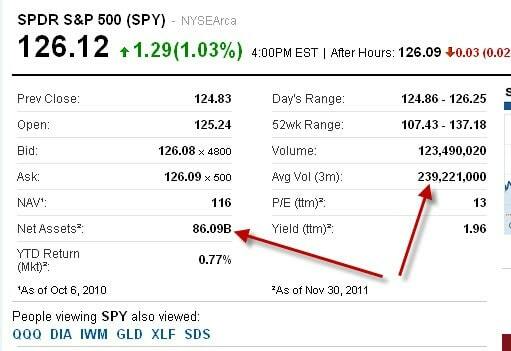 The larger the spread, the more you pay every time you buy and sell a fund. ETF’s with very few shares traded have a greater spread than those with a great many shares traded every day. That means funds that are less liquid are in effect more expensive. You can see that the average volume is 18.6 million shares per day and the net assets are $207 million. 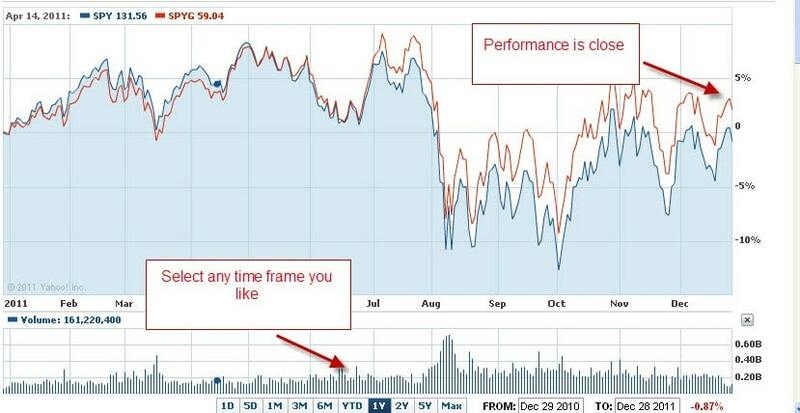 Let’s compare this to another ETF – SPY. As you can see, the performance is pretty close. That being the case, if I was given the choice between these two funds, I’d go with the larger and more liquid SPY vs. SPYG. Please note at the lower end of the graph you can select different time frames to compare the same funds. That’s a useful tool that I encourage you to take advantage of. Basically this is all you need to pick the right ETF. Go through this process when you evaluate each of the candidates on your list. To be completely frank, I don’t spend much time worrying about expenses because that all comes out in the wash. Here’s what I mean. The chart above shows performance after all fees are deducted. I wouldn’t think twice about buying a more expensive fund if the performance justified it. I’m sure you would do the same thing. That’s why liquidity and performance are far more important to me than expenses and transaction fees. Make a decision about what kind of ETF you want to buy. Get a list of all the available alternatives and then compare each one by liquidity and performance. The right choice will be obvious. And if it’s not obvious it probably won’t matter which fund you buy. If the performance and liquidity are very close, it’s likely that those funds will continue to track each other. This of course is no guarantee of future results. While I think it’s always important to have the strongest investments, my experience tells me that it’s far more important to use the proper investment strategy in order to achieve your long-term objectives. When it comes to equity investing, most ships rise and fall with the tide. That means if the market is strong, everyone is going to be happy and make money – including you. It won’t make much difference which fund you buy. 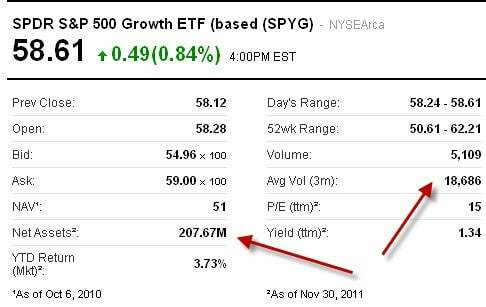 Over many years, you’re not going to see a huge difference between one large cap growth fund and another. But you will see vastly different investment results depending on the investment strategy you end up using. How do you pick an ETF? What tools do you use? I am in the process of learing about ETF’s right now, my main focus is emerging markets!